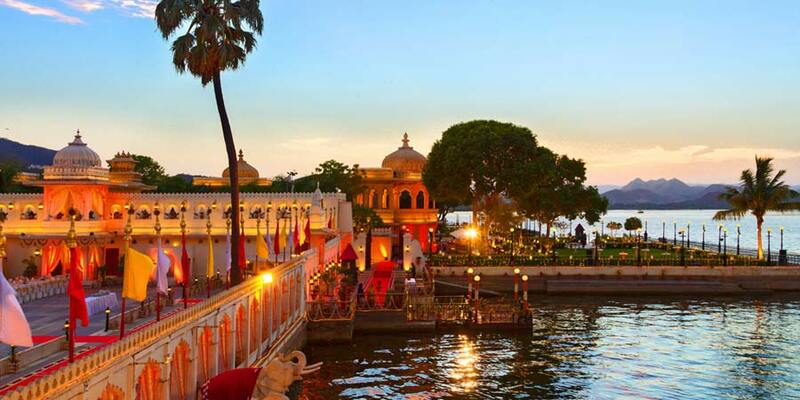 Jag Mandir Palace is a beautiful and luxurious palace on an island in Lake Pichola. Well known as Lake Garden Palace, it's construction completed in the reign of three Maharanas of Sisodia Rajputs. It work was started by Maharana Amar Singh in 1551 and then continued further by Maharana Karan Singh (1620–1628) and ended by by Maharana Jagat Singh I (1628–1652. Also referred as 'Swarg Ki Vatika' or 'Garden of Heaven', it was used as a palace for holding royal parties and summer resort. Jag Mandir Palace has some fascinating and marvelous carvings such as a row of the elephant look as guards of the Palace. It has amazingly architecture Mahals and scenic gardens. Now it is converted to a luxurious heritage hotel by HRH Hotel Groups. The history of Jag Mandir Palace goes to the days of Emperor Shahjahan and Maharana Karan Singh. Shahjahan was given refuge by the Maharana Karan Singh in the City Palace Udaipur. Maharana Karan Singh built the Gul Mahal which was later named as Jag Mandir Palace for Shahjahan and shifted him and his wife in the palace located midst the lake. After the death of Emperor Jahangir, Shahjahan took the seat of Emperor and was named as Shahjahan at Jag Mandir Palace before his departure to take the throne. It was later enlarged by his son Jagat Singh into a huge palace and named as the Jag Mandir palace. For building such a beautiful palace, Maharana Jagat Singh was regarded as one of the finest architects of the Mewar dynasty. Some of the most notable architecture and building inside the Jag Mandir Palace are Gul Mahal, Garden Courtyard, Darikhana , Bara Patharon ka Mahal , Zenana Mahal , and Kunwar Pada ka Mahal. Gul Mahal : It was the first structure built in the Jag Mandir Palace in 1551 by Maharana Karan Singh of Udaipur. It was built with yellow sandstone initially which was later further developed by Maharana Jagat Singh. It has three circular dome one over other and the top dome have a crescent of Islam. The Mahal is surrounded by a roomy circular apartment built in white and black marble with murals and paintings considered an uncommon feature in Rajput architecture. Jag Mandir : It is the main building of the Palace which comprises of Gul Mahal too. The towers are of octagonal shaped and at the top have cupolas over it. The palace features residential suites,courtyards, and reception hall. The Zenana Mahal is located just adjacent to the palace. While Kunwar Pada ka Mahal is at the western end of this palace building. Entry Pavillion : The pavilion at the entry to the palace is an impressive white colonnade of cusped arches. The landing jetty is also located for docking of boats arriving from the jetty of Bansi Ghat on the main land near City Palace in Udaipur. The cruise is through the Pichola Lake. The pavilion is decorated with large elephants carved in stone, four on each side of the entry steps. HRH Group of Hotels manages the Jag Mandir Palace Hotel in Udaipur . It is one of the most stunning heritage hotels in India which is famous all around the world. Year after year, Jagmandir Island Palace continues to make news in the global glamour world for the exclusive ‘regal experiences’ it offers. The Darikhana : The Darikhana restaurant is an exclusive venue for stylish dining. It’s a colonnaded restaurant, specially air-conditioned for guests, and offers an select international cuisine. A varied a la carte menu is offered for evening dining. The specially prepared four-course dinner, is highly recommended. Picholi Bar : The Barah Pathoron ka Mahal, or the Palace of Twelve Stones, houses the Picholi Bar. The bar derives its name from the oldest settlement on the banks of Lake Pichola, the Picholi village. Enjoy a leisurely drink of wine or beer while soaking in the commanding view of the City Palace and Lake Pichola from this historic venue. By Road: Jag Mandir Palace is located on a island in the Lake Pichola of Udaipur city. One can easily reach here with local taxi, private buses or cab. By Rail: Jag Mandir Palace, Udaipur is well connected through nearest Udaipur Railway station to major cities railway stations like Delhi, Agra, Mumbai, Chennai, Bikaner, Jodhpur, Jaipur, Ahmedabad. By Air: Jag Mandir Palace can be reach through nearest Udaipur Airport which is well connected with regular domestic flights to Delhi, Kolkata, Mumbai, Ahmedabad, Jodhpur and Jaipur.